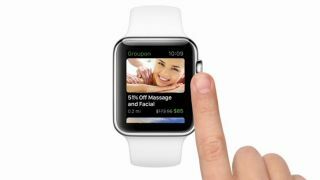 Groupon has updated its iOS app to include support for Apple Watch, so now you can get information about money-saving deals beamed directly to your wrist. The Groupon Apple Watch app uses location information supplied by your tethered iPhone to let you know about any deals and offers from stores or restaurants that are nearby. While it's not a hugely game-changing statement in terms of tech, it shows that bigger brands are finding new ways of harnessing the power of having a location-aware wearable that can supply discreet notifications you might be interested in. This is particularly handy if you're the sort who likes to just wander around town and window shop – the Groupon Apple Watch app lists deals based on their proximity to your location. You can scroll through deals via the Apple Watch's digital crown or through taps, and if you see a decent deal that's a little too far to walk to you can buy it directly from the app.